You can Google Fort Collins history and its centennial celebration in 1964 (and the controversy over Jack Benny's hand prints...) and find out all you would ever need to know about the city's founding, so I will spare the repetition. As 2014 marks its 150th birthday, I thought it appropriate to feature this vinyl ode to the city's heritage. 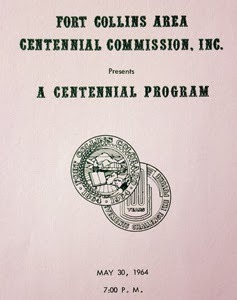 According to the history of this recording, it was suggested three years previous by the late Dr. Robert Hayes, the former mayor of Fort Collins. 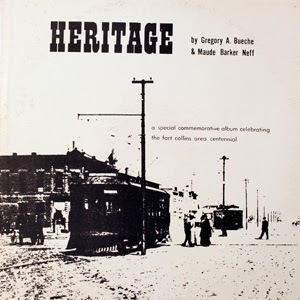 Recorded in 1964, Heritage is billed as "a dramatic expression" of the city's history. Lots of pomp and pageantry on here, as evident in the first cut on the disc - a formal 13 minute speech, written by local historian James Miller, and read by Pastor Ray E. Howes. Gregory Bueche (the head of CSU's music department since 1937) dips into the school's talent pool, featuring the CSU Symphonic Band and its University Chorus, for the non-speaking sections of the recording.